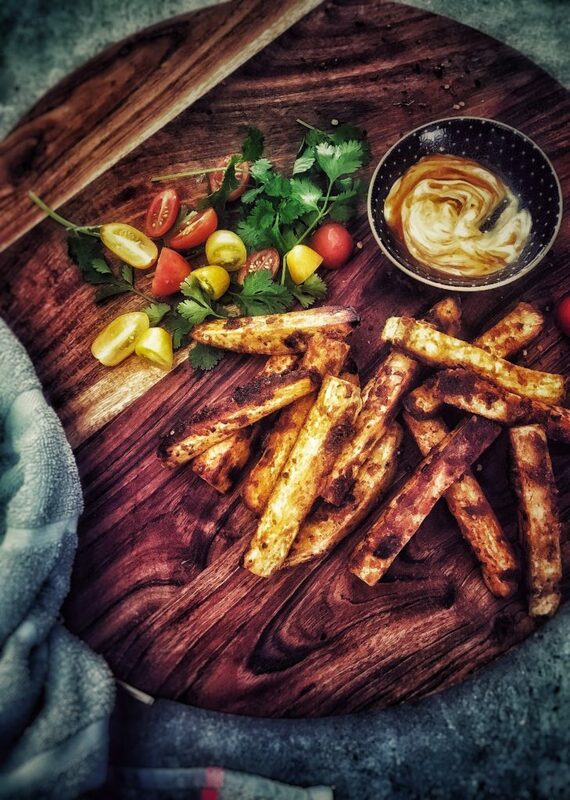 ﻿ Cheesy Chilli Kumara Chips - I AM Co.
Soooo… we may have performed a wee ‘happy dance’ when these chips came out of the oven. It’s been a long mission of ours to make crispy, crunchy wedges. Wedges with a crunch when biting into them, and pillows of soft sweetness in the centre. Yussss, we’ve done it and there’s already been requests from family and friends to make these hippies again. To complete the meal, we were hoping to serve them with a gorgeous guacamole but someone polished off all the avos! Instead, we whipped up an aioli, mixed in a bit of sriracha and voila! It was delicious. The savoury yeast give these chips a good ol’ cheesy flavour so it’s perfect for those that are vegan. 2 large kumara peeled and cut into chips. Preheat oven to 200 deg Celsius, fan-bake. Prepare kumara and set aside. Mix remaining ingredients into a bowl large enough to toss the chips through. If the marinade is too thick, loosen slightly with a bit more coconut oil. Toss the chips through the marinade ensuring each one is well coated then lay onto a large baking dish and bake for 15-20 min, turning once until golden. Place onto a serving dish with whatever condiments suit. Dip and enjoy x.